Pago restaurant owner Scott Evans and sommelier Evan Lewandowski have launched a monthly series of wine dinners called the Summer Sommelier Series. If the first one—a Bastille Day celebration—is any indication, the Summer Sommelier Series dinners shouldn’t be missed. The Bastille Day wine event at Pago—called the Binner Dinner—featured the wines of unorthodox Alsatian winemakers Audrey and Christian Binner, for whom Lewandowski worked in France, and whom he considers family. The wines were extraordinary, as was the food cooked by Chef Phelix Gardner and his culinary team. That they managed to cook an extensive, multicourse Alsatian-style meal for a sold-out restaurant in the tiny Pago kitchen was quite a feat in itself. And, who knew you could sell out a restaurant with a wine dinner featuring solely white Alsatian wines? Before I sing the praises of the Binner wines, I should say up front that they aren’t currently available in Utah. However, you can special order them (a one-case minimum) through the DABC, and Lewandowski said he’s hoping to get the state to bring in some of the Binner wines. I sure hope he succeeds. As I already mentioned, these wines are exceptional and unique. The Binner family has been making wines in Alsace since 1770, and today, the wines are made naturally, with a rare “leave it alone” approach. No sulfur, sugar or other additives are incorporated into the wines. Christian Binner says that yes, “it is harder to do nothing, add nothing, take nothing away, not tweak anything—but it works!” The result is nontechnological wines that I guess you’d call “truthful.” There’s no smoke and mirrors, just real wine made from fruit, natural yeast and not much else. The Pago Bastille Day dinner began with a fizzy Katz’en Bulles Riesling Pétillant Naturel 2009, which was a terrific match for passed hors d’oeuvres of tarte flambée with garlic scapes and the torchon de foie (foie gras with local cherries). 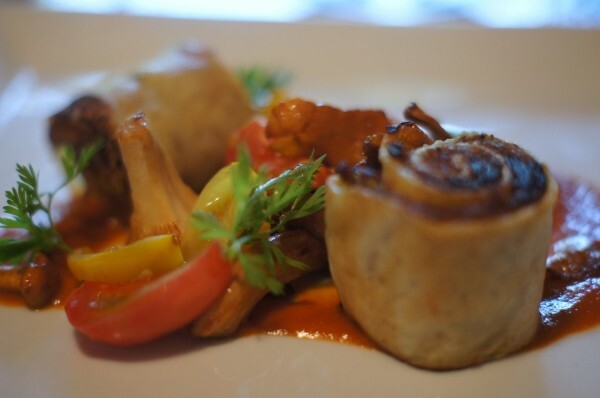 Next came thin-sliced Morgan Valley lamb roll-ups in phyllo with chanterelles and cherry tomatoes and a sensational, dry Gewurztraminer called Cuvée Béatrice, named for Christian Binner’s sister. Lewandowski referred to the wine as one of the most “freaky deaky” he’d ever tasted, and it was an unusually beautiful rendition of GewÃ¼rztraminer, a wine that is so often notoriously sweet. It was also an excellent match for braised rabbit with chorizo and local honey in puff pastry. I wasn’t quite prepared in midsummer for the massive, winter-like serving of pork in the form of the Alsatian classic: choucroute garnie. But, we did manage to work our way through most of the ginormous Sugarhouse Farms bone-in pork chop, roasted ribs, pork belly, pork sausage (made in-house), apricots, sauerkraut, fingerling potatoes and lemon spaetzle with sockeye salmon and zucchini. Whew! For the choucroute garnie, Lewandowski selected dueling Binner Rieslings: Vignoble de Katzenthal 2009 and a Grand Cru Schlossberg 2009, both of which were outstanding wines. Reeling from so much good food and wine, we still enjoyed a light, airy chocolate la fÃ´ret noir, paired with a botrytised Pinot Noir called Cuvée Béatrice Blanc de Noir 2005. It was the perfect conclusion to a perfect dinner. Upcoming Summer Sommelier Series dinners at Pago include a tasting of Rosé wines from around the world in August, and a dinner featuring Ruth Lewandowski wines in September. Evan Lewandowski has been quietly crafting his own wines here in Salt Lake City, and this will be the first opportunity to taste his three “freshman” releases.